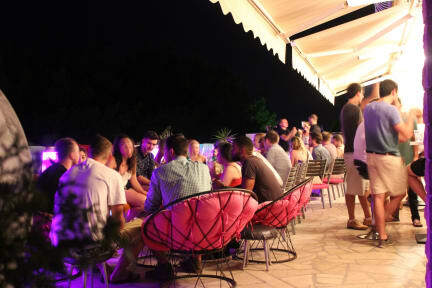 Villa Marija is Hvar’s best-loved, award-winning and top rated hostel, recognised for years as simply the hottest and most social spot to stay while in Hvar. Hostel is located on a hill, within 15minutes walking distance from the historical centre of Hvar town, giving hostel guests excellent access to all major attractions and hot spots of the city. The best pebble beach in Hvar is 400 meters away. Villa Marija Hostel features a luxurious and stylishly decorated sea view outdoor terrace with swimming pool and cocktail bar, providing the perfect place to meet like-minded international travellers. To meet all travellers needs, our hostel offers a huge variety of facilities and fancy stuff including music&reading lounge, big fully equipped kitchen, outdoor showers with plenty of hot water, chill out area with comfy beanbags and exotic sofas to relax on. To catch-up with friends and family or to plan your next trip, Villa Marija has computer access and high-speed free wireless internet available in all guest rooms and throughout the entire hostel. In addition, our hostel restaurant is open daily where you can enjoy a delicious selection of fresh food throughout the day, whether you fancy one of our generous breakfast or opt for a late night pizza delivered directly to your room. Book your boats, scooters, day trips or any activity at our reception. 24hours available local staff will ensure you have the best possible stay on this party island. To help you get around, we've got a book exchange, free maps and advice and free access to guide books from all around the world. There's also free luggage storage. Choose between modern, bright colourful private rooms with balcony overlooking the sea or air-conditioned high-standard dorms with pin protected entrance. Most of our comfy bunk beds have curtains for extra privacy and comfort and are equipped with power socket and personal reading light to help you rest and relax during your stay. There is also individual USB socket with fast charging - just in case you forget that boring international adapter. Large volume safety individual lockers are placed right next your bed - these are free of charge to use but make sure to bring your own padlock or rent one at our reception. To make you feel completely safe, our hostel is equipped with security cameras, night security guard and wristband policy which all the guest must be wearing during the stay in our hostel. Traveling alone or in a group, you will have plenty of chances to socialise during our action-packed activities, such as: Happy hours, Pub crawls, daily events and music festivals (Ultra Music, For Hvar…). We also have a strict rule that after 10:30PM is quiet time (required by Croatian Law) even though most guest are warming up for the party at that hour. So in order to continue the fun, Villa Marija Hostel organise nights out where everybody is welcome to join us for some shots at the famous Kiva Bar. - AGE LIMIT: Please note that guests of the age of 45 or over are not allowed to stay in shared dorms; they must book private rooms.